Acorn squash are indigenous to the western hemisphere, so they were not known to Europeans until after the voyages of Columbus. The seeds have been found in ancient Mexican archeological digs dating back to somewhere between 9,000 and 4,000 B.C. Squash is a nutritious food and it (winter squash) forms an important part of the Native American diet. Squash belongs to Cucurbitaceae family and the botanical name of acorn squash is Cucurbita Pepo. The squash was initially considered a melon by the Europeans settlers in America. Though considered a vegetable in cooking, botanically speaking, squash is a fruit (being the receptacle for the plant’s seeds), and not a vegetable. Like all varieties of winter squash, the popular acorn squash is rich in vitamins A and C, potassium, B vitamins, and numerous minerals. And acorn squash is particularly high in fiber, which plays an important role in intestinal health. 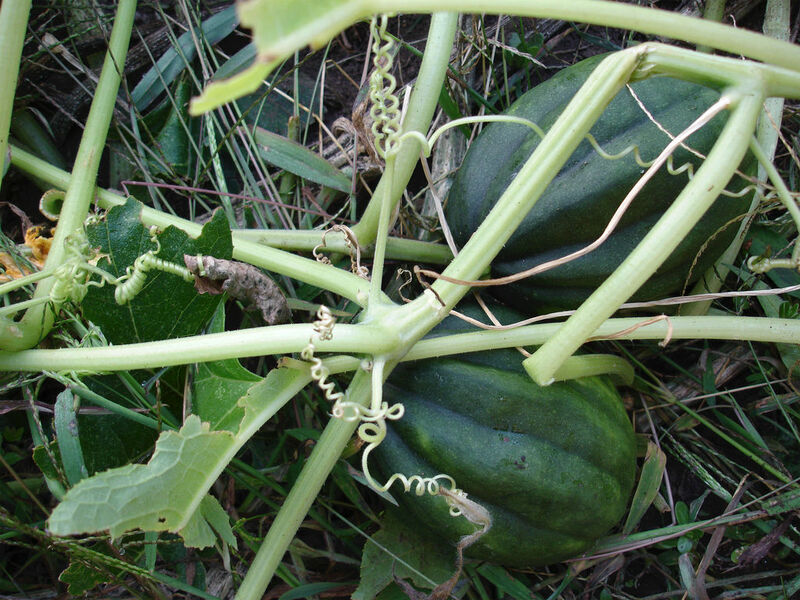 Cucurbita Pepo is an annual plant, hispid and scabrous, with a procumbent stem and branching tendrils. Its leaves are large, cordate, palmately 5-lobed, or angled and denticulate. The flowers are yellow large, axillary, and the males long-pedunculate. Corolla campanulate; the petals united and coherent with the calyx. The calyx of the male flowers is 5-toothed; of the female the same, the upper part being deciduous after flowering; the stigmas are 3, thick, and 2-lobed; the pepo, or fruit, subligneous, very large, roundish, or oblong, smooth, yellow when ripe, furrowed and torulose, containing yellowish seeds, somewhat resembling those of the watermelon in form. The seeds are “about 2 Cm. (4/5 inch) long, broadly-ovate, flat, white or whitish, nearly smooth, with a shallow groove parallel to the edge; containing a short, conical radicle, and 2 flat cotyledons; inodorous; taste bland and oily. The pumpkin flowers in July, and matures its fruit in September and October. It is extensively cultivated as a kitchen vegetable, and for cattle. The seeds of this plant are used in medicine, and have long been popular with the Mayans as a remedy for worms. Maya holistic therapist, Maria Hux, learned this ancient Mayan recipe from her ancestors; based on roasted baby acorn squash seeds, Sikil Pac was a Royal treat among the Mayan. Hard working people find this appetizer to be a great way to boost the immune system. Sikil Pac helps fight the cell damage caused by extreme stress and emotional pressure. This Mayan recipe truly works great as a gourmet appetizer and can be stored in the refrigerator for up to three days. Preheat oven to 375 F grease 1 ½ quart casserole or 8-inch glass baking dish. Variation: for individual servings, pour custard mixture into 6 or 8 ramekins or custard cups. Place on a baking sheet. bake for 35 to 40 minutes or until knife inserted in center comes out clean. Combine sugar, eggs, cinnamon, salt and nutmeg in medium bowl; mix well. Add pumpkin and half-and-half, mix until well blended. Pour into prepared dish. Sprinkle ginger evenly over top of pumpkin mixture. Bake 45 minutes or until knife inserted in center comes out clean. cool in wire rack at least 20 minutes before serving. serve warm or at room temperature. garnish with whipped cream and sprinkles. (you may substitute for any other squash seeds, if fresh, wash and roast 5 minutes, peel). Pinch of crushed sea salt. Crush the roasted seeds into a fine paste. Mince tomato, chile (your choice), and red onion. Finely chop the cilantro leaves. Thoroughly mix all of the ingredients above with the lime juice in a clay bowl (glass will do) until it forms a smooth creamy paste. Add sea salt to taste. Let stand for 15 minutes to blend flavors; serve at room temperature as a healthy zesty topping to handmade corn tortillas, fried tortilla chips, or fresh celery sticks. If you not find Habanero chile in your area, use fresh serrano or jalapeño chile as a substitute. Maize, Zea Mays L, pronounced (meiz); which is known in many English speaking countries as corn is a grass domesticated by indigenous peoples in Mesoamerica in prehistoric times. The Aztecs and Mayans cultivated it in numerous varieties throughout Central and Southern Mexico, to cook or grind in a process called Niztamalization. 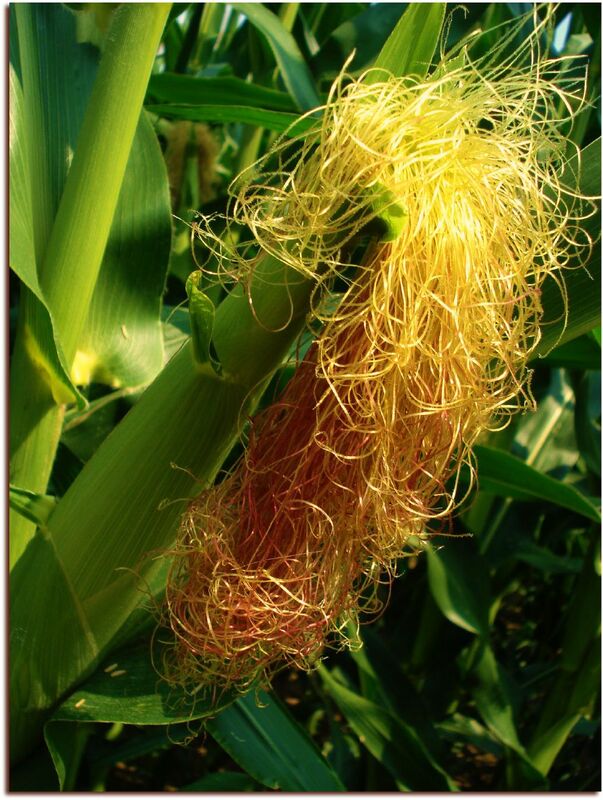 Experts have established that modern maize evolved from teosinte (God’s corn), or Zea mays ssp. Mexicana, although some botanists continue to argue that it evolved from an early MesoAmerican maize variety called Chapalote. Even the timing of maize origins has been questioned. 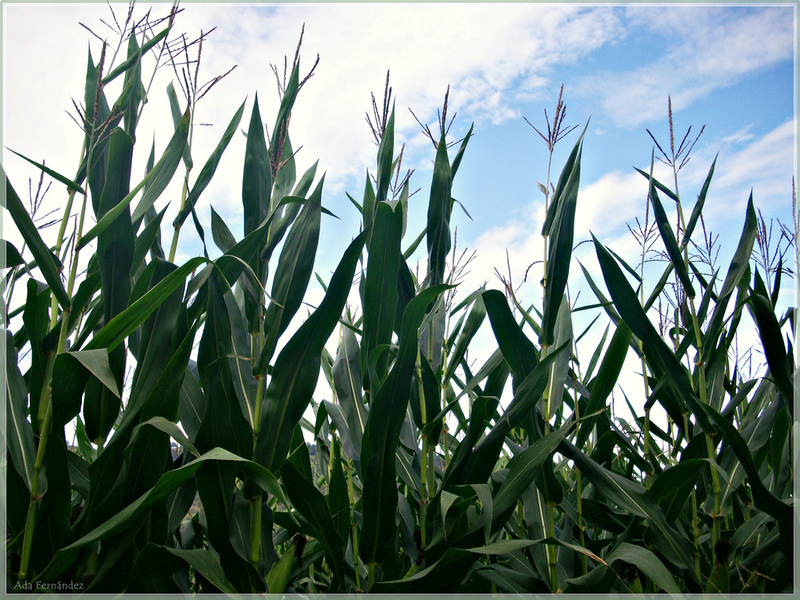 The earliest known ears of corn were tiny – only a few inches long. The origins of maize begin on the Pacific slope of the modern Mexican states of Oaxaca, Tehuacán, and the Valley of Mexico. The earliest primitive corncobs discovered in Mesoamerica were obtained from specimens recovered within a cave near Oaxaca. The Columbian Exchange was a dramatically widespread exchange of animal, plants, culture (including slaves, communicable diseases, and ideas between the Eastern and Western hemispheres. This exchange of plants and animals transformed European, American, African, and Asian ways of life. New foods became staples of human diets, and new growing regions opened up for crops. Due to its worldwide distribution and relative lower price to other cereals, the maize has an ample uses than any other cereals. In many developing countries the maize is a major staple food and the consumption percapita is very high. Ground, yellow cornmeal can be used to make tamales and Atoles (thin porridge) or baked items. It is fortified with iron, calcium, vitamin A and B vitamins. There are reportedly hundreds of varieties of tamales throughout Mexico, Central and South America. They key variations are what is in the masa or dough (corn, potatoes, rice), what’s in the filling (meat, fruits, nuts). Masa simply means dough in Spanish. Once formed into masa, the dough is patted by hand into the familiar tortilla shape or used as dough to be shaped around tamales or other foods. In order to produce any one or more of the aforementioned maize-based foods or beverages, maize must be reduced to a paste or flour. The resulting by-product was known to the Mexica-Aztecs as nixtamal, and the process for rendering the maize kernels into a paste has since come to be known as nixtamalizacion. Mexican tamales are packets of corn dough with a savory or sweet filling and typically wrapped in corn husks or banana leaves. 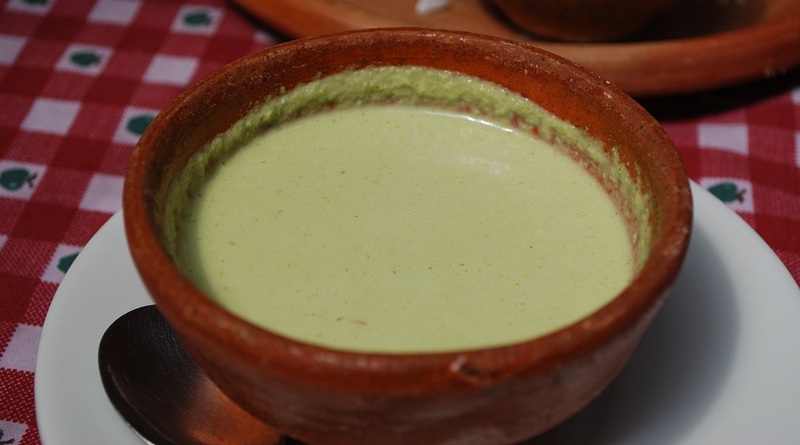 The packets are steamed and eaten traditionally served with Atole (masa drink). Tamales colorados (“red tamales”) owe their name to the tomato that give them their color, developed with corn or rice masa and are stuffed with tomato recado, raisins, chili, chicken, beef or pork. Tamales negros (“black tamales”) are darker and sweeter than their red counterparts due to the chocolate which is added to them. Other black tamales are not sweet but are simply made out of blue/black corn. Tamales dulces (“sweet tamales”) are tamales that are explicitly sweet and contain fruits and nuts (such as raisins and almonds) and may not contain meat. 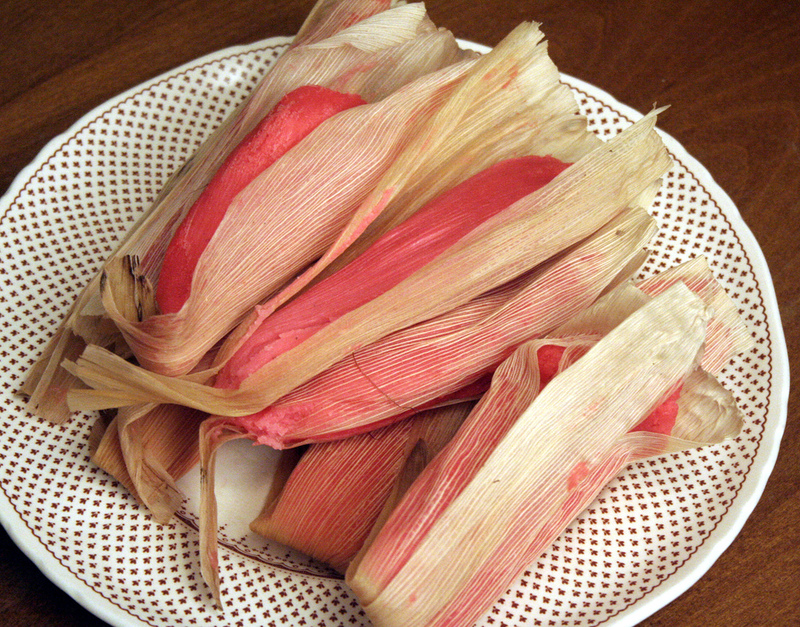 Tamales de elote (“sweet corn tamales”) do not use the typical masa but instead are made out of sweet corn. These usually contain whole kernels of corn in the masa and do not generally contain meat. Traditionally the fat of choice was fresh lard. This will vary with the recipe but some will use lard, some butter or vegetable shortening, or a combination of two or more of these. If you use lard, use only fresh lard and if possible, get freshly rend pork lard from your butcher. Some of the dough recipes will use baking powder for lighter tamal corn dough. The ground corn is most commonly mixed with water, chicken broth and even sometimes milk. The individual recipe will dictate the proper liquid. Salt is almost always added to the dough to enhance the flavor of the corn. Bring a large part of water to a boil. Cut through the corncob at the stem end where the kernels start and carefully remove the husks. Set aside the largest for wrapping and blanch them in boiling water for a couple of minutes to make them more pliable. Remove from the water and drain on paper towels. Cut the rest of the husks into strips for tying or to cover the humitas before steaming. Remove the silk from the corn and rinse. Cut the kernels from the cobs, adding the milk scraped from the cobs. Reserve the cobs for later use. Place the corn and scallions in food processor or blender and pulse until finely ground. Add the butter, egg yolks, cornmeal, baking powder, salt, sugar, cheese, and brandy. Pulse until well incorporated and smooth and transfer to a bowl. The mixture should be thick but not runny. 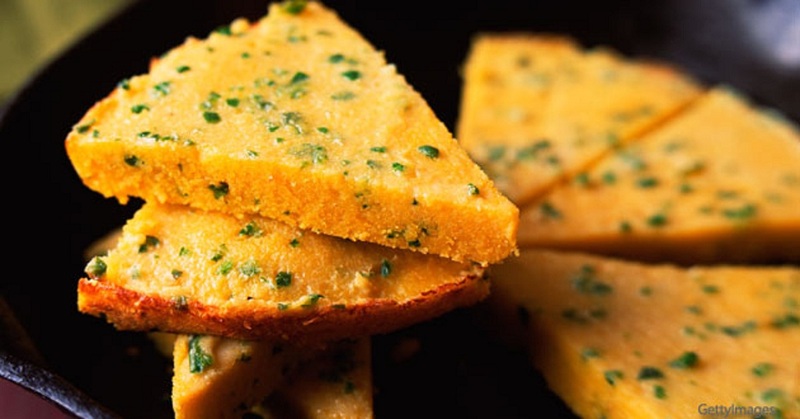 Add more cornmeal, as needed. In a seperate bowl or using a stand mixer, whip the egg whites to form soft peaks. Carefully fold the whites into the corn mixture. To assemble the humitas, place two husks on the worktable, slightly overlapped. Place a few spoonfuls of corn batter in the center of the husks. Fold bottom edge over the mixture, fold down the top half, then fold in the sides to form a packet. Tie with string or corn husk strips. Repeat with remaining batter. Place the cobs in the bottom of a large saucepan. Add the water until cobs are almost covered. Cover the cobs with the remaining husks. Place humitas open side up over steamer. Cover with remaining husks. Cover the pot and bring to a boil. Steam until the humitas feel firm to the touch, about 30 minutes for small and 45 minutes for large. Add more boiling water if needed. Remove from heat and serve with ají criollo. Leftovers are great for breakfast and can be reheated or pan fried. Makes 12-16 humitas. In a processor grind the corn kernels along with the eggs, cream cheese, baking powder and sugar. Butter a medium pan, then sprinkle with flour and remove excess. Add to corn mixture slits poblano, onions and season with salt. Pour into pan and bake at 180 ° C for 35 to 40 minutes depending on the mold. Serve with tomato sauce. Cream the butter and sugar until light and fluffy. Mix the rice flour with the masa, adding water until the dough is well mixed. Add the beaten butter-sugar mixture to the dough, beating after each addition until the dough is light and fluffy. Add red food coloring if desired. For the filling, mix the cinnamon, sugar, raisins, almonds and sweet cream. Fill, wrap and steam following the directions for basic tamales. 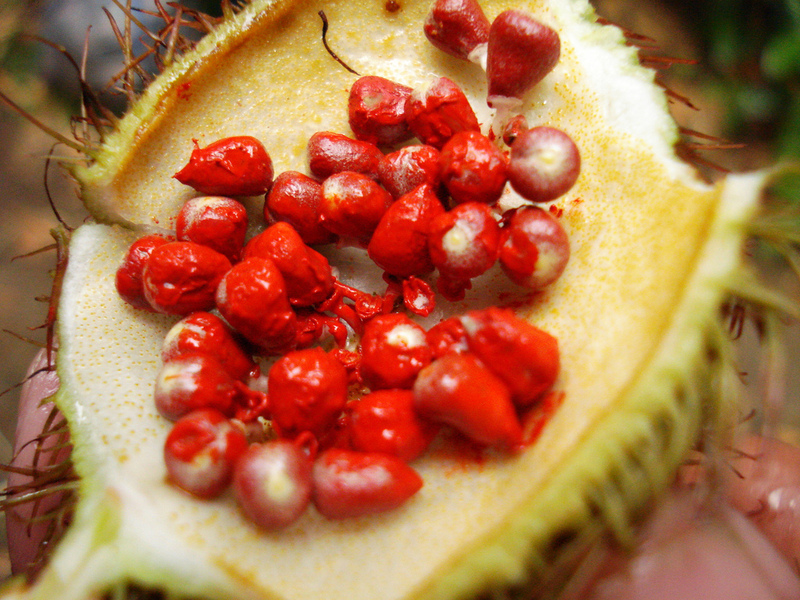 The Bixa orellana fruits have been found in old civilizations in Peru – such as the ancient cities of Caral and Casma – dating as far back as 5000 years ago. 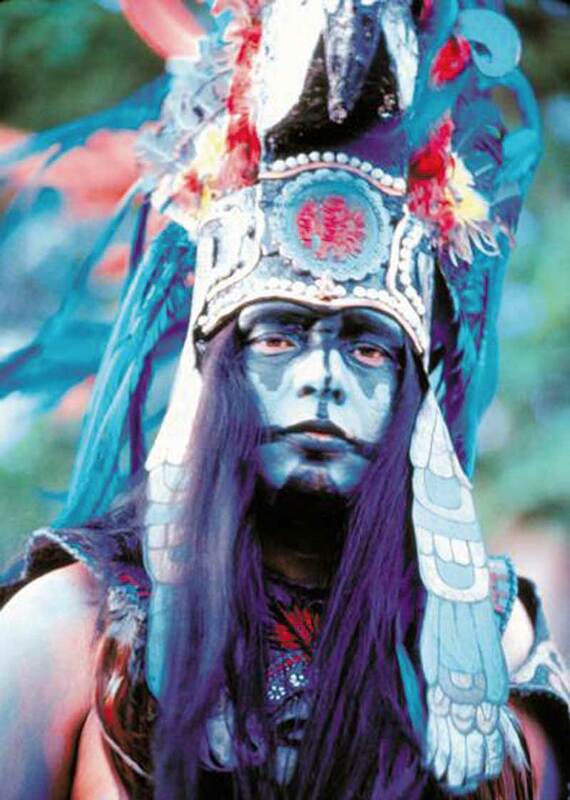 It is believed to come from Brazil but was carried throughout Central and South America by the Indians, who used the coloring as body paint, and by women, who used it as lipstick. The dye contains Vitamin C. The names derives from the Nahuatl word for the shrub, Achiotl. It is known as Aploppas, and its original name Urucu. Many Latin American cuisines traditionally use Achiote in recipes of Spanish origin that originally call for Saffron; for example, in Arroz con Pollo, to give the rice a yellow color. 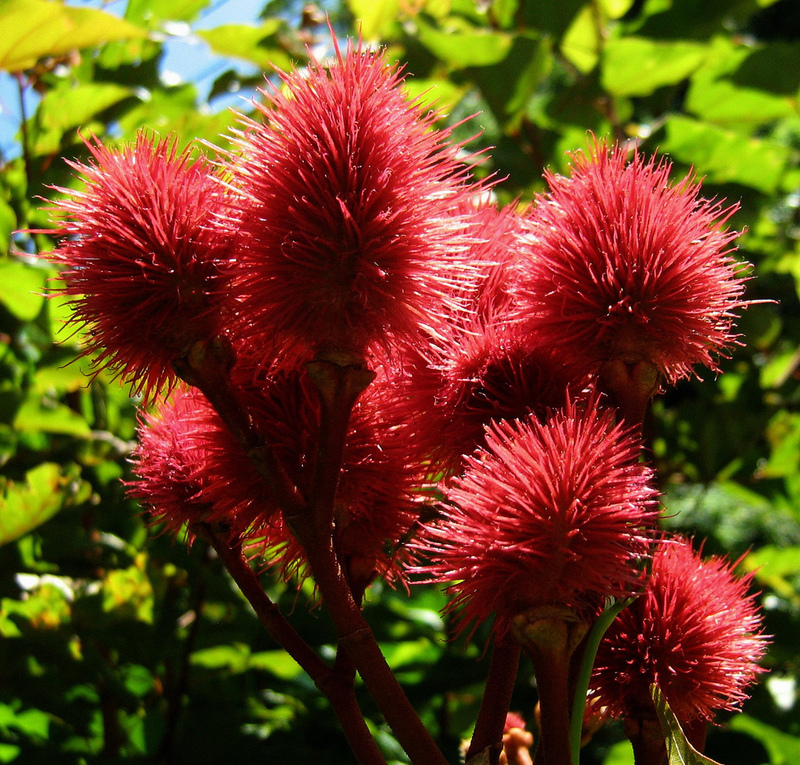 Achiote is a small tree with a round head, generally grown as an ornamental because of its lovely flowers of various colors. The seeds of the flower have a reddish powder which is used as a vegetable tint for soaps, rice, margarine, cheese and many other products. The scientific species name orellana is derived from the name of Francisco de Orellana, a Spanish explorer of the 16.th century. Together with Francisco Pizarro, Orellana had been involved in the destruction of the Inca Empire; in 1540, he participated in another expedition led by Gonzalo Pizarro. Following false rumours about gold and cinnamon trees, about 2000 Spaniards entered the Peruvian and Brazilian jungles, where most of them perished. Orellana abandoned the party and made his way eastward, where he (more or less by chance) discovered the Amazon River and earned scientific fame quite undeservedly. Other names of this plant all stem from Indio tongues in Central and South America: urucul from Tupi-Guarani in the Amazon region, (thence French rocou), annatto from the Cariband achiote from Náhuatl in México. The scientific genus name, Bixa, comes from another Carib plant name usually transcribed as bija or biché. In South México, meat is often marinated with a spice mixture called “recado” that derives its vibrantly red-yellow color from liberal addition of Achiote. 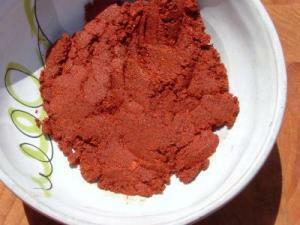 The seeds may be used ground (often after soaking in hot water to soften them) or in form of Achiote oil. Recado‑mari­nated meats are wrapped in banana leaves and baked in a hot stone pit. Baking in a hot oven, pan-frying or grilling is also possible. The technique can be applied to poultry and fish, but is most popular for pork, especially suckling pig. Food prepared this way is generally referred to as Pibil. 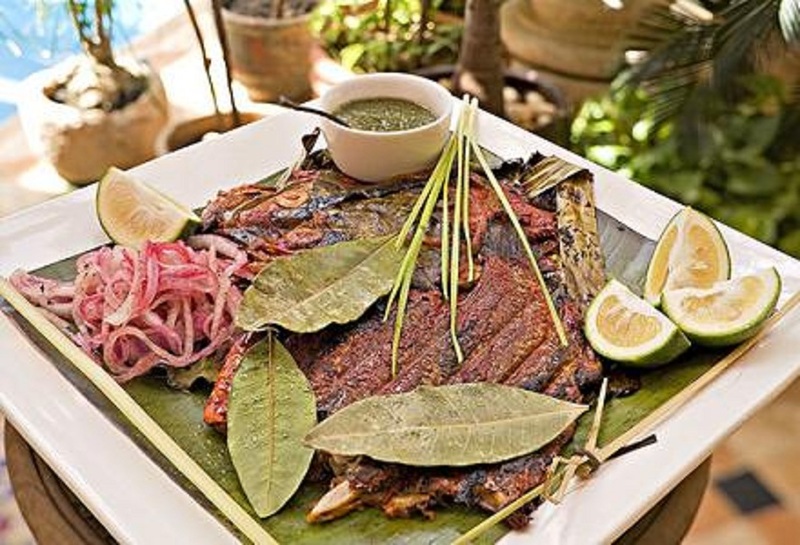 However, today’s unique dishes of the Yucatan are a combination of ancient Mayan cooking techniques, such as charring and grinding chiles to release their flavors, and the spices that were introduced to the Mayans by the Spanish in the 1500s. 1 cup bitter (seville) orange juice. In a mixing bowl, dissolve Recado Colorado in vegetable oil, then stir in orange juice. Place each fish in large glass or ceramic dish and rub the flesh generously with seasoning mixture. Scatter the bay leaves over the fish and marinate, refrigerated, for at least 1 hour or overnight. Place each marinated fish in its own banana leaf square; top each fillet with a slice of tomato, green bell pepper, onion and an epazote leaf; then wrap and tied with a thin banana fiber (from center of leaf). Heat your grill well then place each wrapped fillet carefully to avoid direct fire; best if cooked with a lid in light medium heat for about 5 minutes. Garnish with red cebollas, bay leaves and lime wedges, and serve immediately. Peel roasted onion and garlic. Quarter the onion. Place onion and garlic cloves in food processor or blender, and puree. Using electric spice mill or mortar and pestle, grind Achiote seeds, cinnamon, peppercorns, cloves, allspice, cumin, and oregano to a powder. Add spice mixture to the onion and garlic, and blend to form a paste. 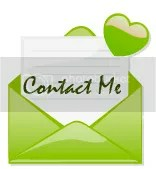 Store the recado in an airtight container in the refrigerator. It should be good for several weeks. 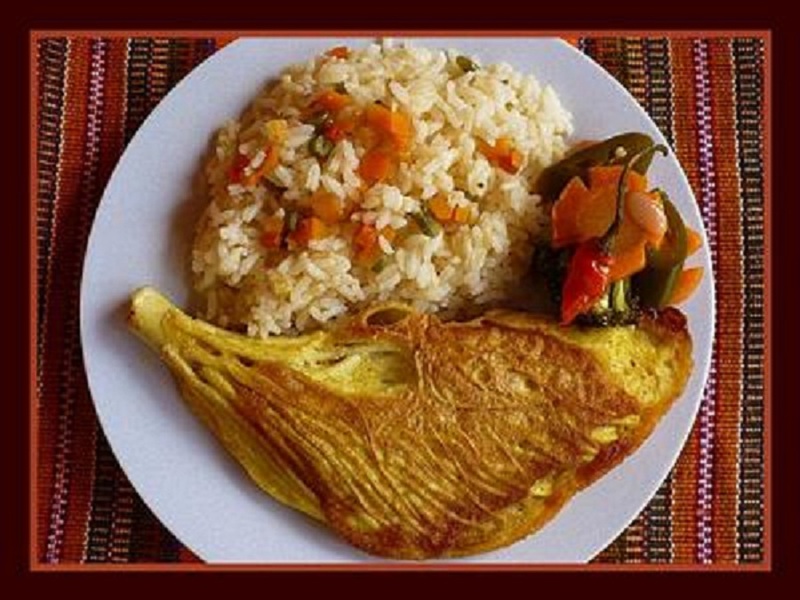 *Tikin Xic, pronounced “teekeen sheek” in Yucatan Mayan and meaning “dry fish”, is a fish dish prepared in the Meso -American style. Have you had any palm lately? The Pacaya Palm or The palm tree grows in tropical and subtropical regions, in moist forests and in mountainous areas. It is found in southern Mexico, Central America and Colombia. 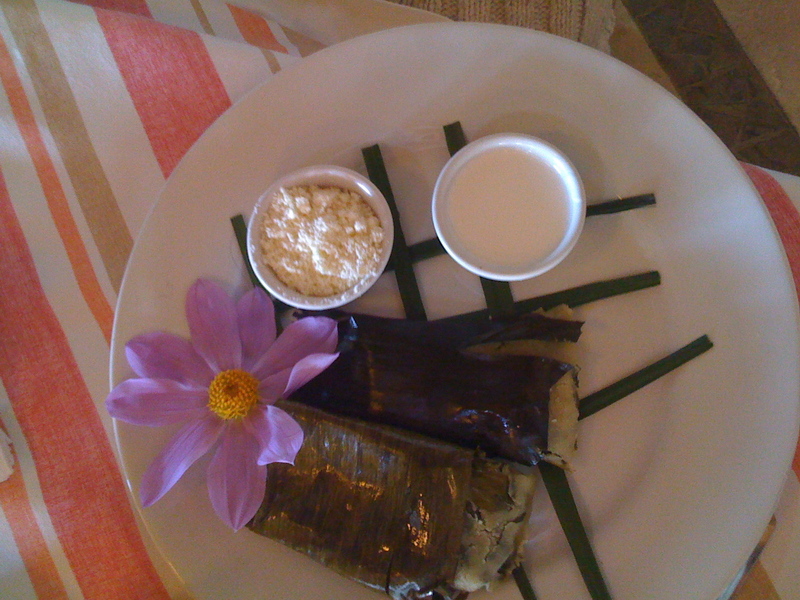 The Pacaya, the edible part of the Palm tree, is in fact the flowers of the plant. The texture is awfully squid-like, and it has a slight bitter taste. You can find the tentacle vegetable in a jar pickled in a briny liquid, or fresh at most supermarkets. Pacayas con huevo (fried) bathed in a tomato sauce yummy, but you can eat them steamed, charbroiled, baked or boiled. If you prefer it fresh you have to blanch the flowers in boiling water for a few minutes which is said to reduce their bitterness and kill any bugs lurking amongst the stamens. Usually solitary trunked but a rarer clumping variety is also found. C. tepejilote has one of the fattest and tallest trunks of all the Chamaedoreas at about 3 inches/8 cm in diameter reaching heights of 20 feet/6 m or more. 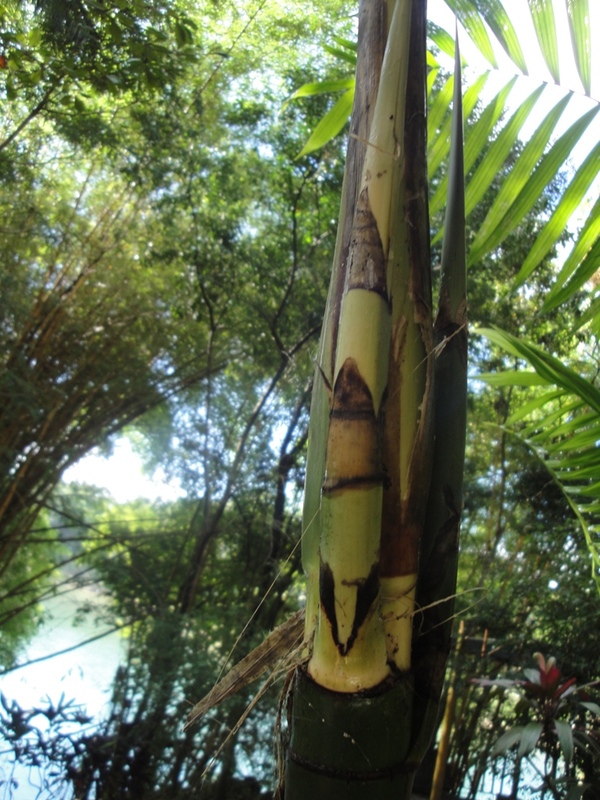 Green ringed trunk with white leaf base scars have visual affinities to bamboo culms, especially when planted en masse. The long, wide, tapering “S” shaped (aka falcate) leaflets fall from the rachis (or droop a bit) in a relaxed manner that just screams tropical rain forest palm. The leaflets of this species are thinner than most,with prominent striations. Though many ‘bamboo-like’ Chamaedoreas have a pale line along the ventral surface of the petiole, it is the most pronounced in this species, and is a characteristic that can help identify it. The flower is protected by a shell covered with hair-like spines. The skin can be cut with a knife, then peeled by hand. The white flower inside is all edible raw. 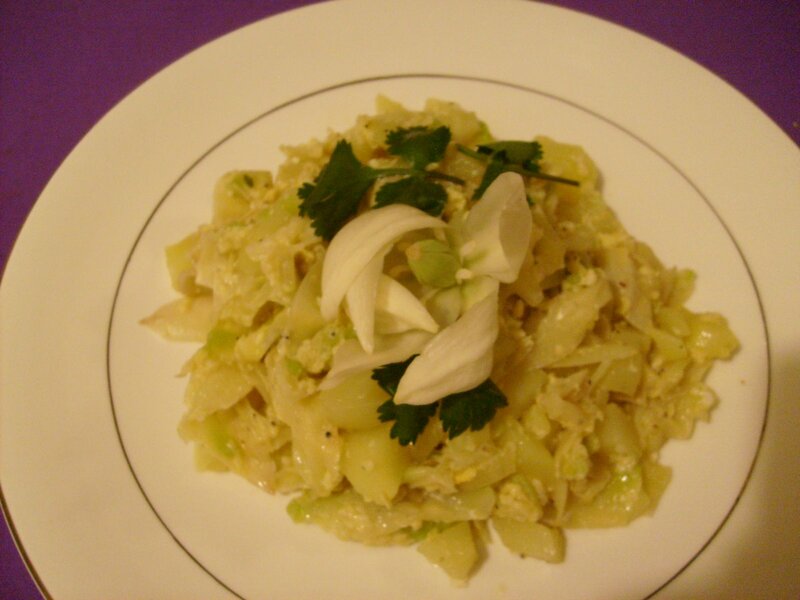 While France is still the largest importer, hearts of palm are becoming popular in the US for salads and appetizers. Most imported into the US are from Peach Palms grown in Costa Rica. Pacaya is an excellent crop for small farmers who would benefit from its development through an increase in export markets. This is a traditional dish from my hometown. My mother used to call it the “veggie calamari” because they look like a baby calamari with little tentacles that are going to reach out and grab you (that’s what I thought when I was a kid). Indeed, it can be another good source of food for the veggie-minded diners, though. Looking for something that will cook quickly, taste great and inexpensive as well, pacayas are just the thing. For this recipe, you will need the following ingredients. If you bought them fresh, cook the flowers in boiling salted water for a few minutes to a nice ‘al dente’ bite.Then, beat egg whites until stiff; add maize flour along with pepper until you create a luscious batter. 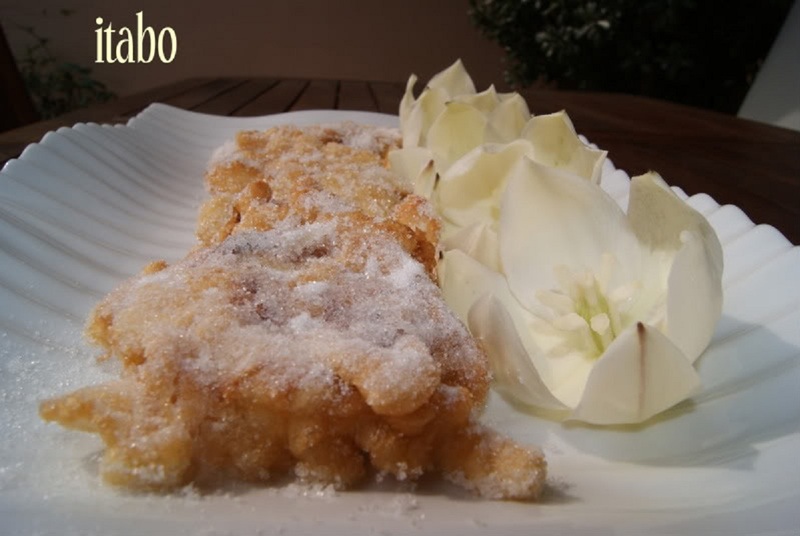 The palm flowers are then draped in the batter and shallow fried until crisp and golden. You can serve it with your favorite rice or spring salad, making a simple, but very satisfying meal. Place tomatoes, onion and garlic cloves in a dry cast-iron skillet or griddle pan over medium-high heat. Roast until all sides are well done, turning occasionally for 7 to 9 minutes. Remove tomatoes and onion; place in food processor. Peel garlic cloves; add to tomato mixture. Pulse until roughly chopped. Transfer to a bowl; add diced jalapeno peppers, cilantro, seville orange, salt and pepper. Refrigerate, covered, up to 2 weeks. Makes 3 cups, enough for 6 portions. Do you think you would like it? Just get over there and try them for yourself. It’s really, really good. Buen apetito a todos! Erythrina berteroana is a genus of tropical and subtropical flowering trees in the family Fabaceae. This tree is native to Mexico, Central America, the Greater Antilles, Colombia and Venezuela. Pito tree is a common species in Cuba and Hispaniola, where it grows wild and it is cultivated and naturalized in Panama. Coral Bean Tree blooms all summer, and its crimson flowers are pollinated by hummingbirds, making for quite a stunning show. Though perhaps toxic or narcotic, in Guatemala, El Salvador and other parts of Central America, the young flowers and new growth are added to soups and other food preparations as a vegetable. It is use in traditional medicine too. A decoction of young shoots is employed as a narcotic. There is a belief that the leaves placed under the pillow, induce deep and refreshing sleep. It is an interesting plant for many reasons, one of which is that it always turns it leaves towards the sun. The showy red blossoms and bright coral seeds of Coral bean make this species a popular ornamental accent plant in sunny gardens. 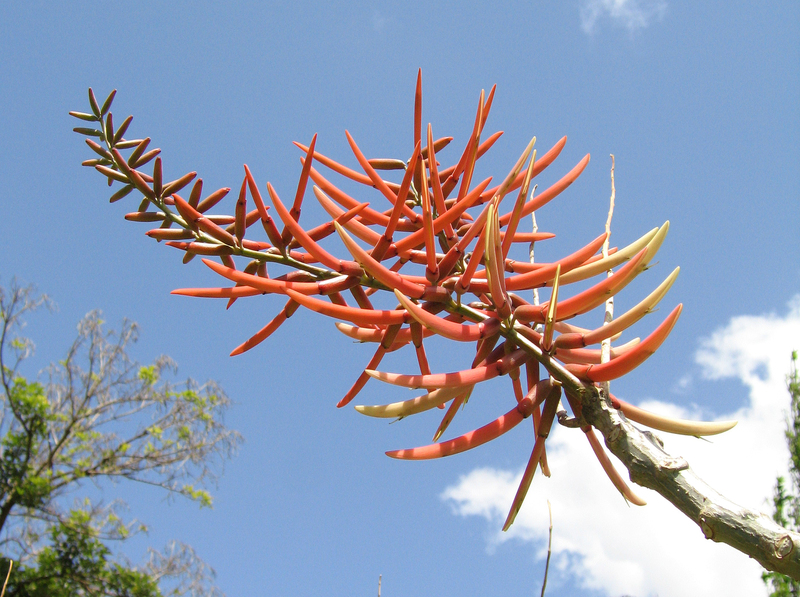 Coral bean plants contain alkaloids that are toxic when ingested. While they are generally not fatal, eating the leaves or seeds may cause severe diarrhea or vomiting. The poisonous seeds are strung into bracelets, necklaces, and novelties. The bark yields a yellow dye, while the crushed branches are used to intoxicate fish. Erythrina berteroana is a tree to 10 m tall, trunk to 48 cm dbh, crown low, spreading, profusely branched; bark pale, smooth, with many or few broad and conical spines; branchlets smooth, lustrous, spines occasional, pyramidal, to 0.6 cm long, often reflexed at the apex. Leaves alternate, trifoliate, 10-35 cm long, the leaflets ovate or deltoid, 5-17 cm long, 4-20 cm wide, margin entire, shortly acute or acuminate at the apex; stalks swollen at the base, 7.5-15 cm; blades usually coated with whitish bloom beneath. Flowers pinkish to red, appearing with the leaves, in terminal racemes, 12.5-25 cm long; each flower 5-10 cm long, embracing 10 stamens, the anthers protruding; ovary stalked, pubescent. Pod dark brown, semi-woody, curved, moniliform, 10-30 cm long, 1-1.5 cm broad, the beak 2-4 cm long, the several seeds. Seed 5 mm long, oblongoid, bright orange red, with a conspicuous black hilum. Erythrina comes from the Greek word ‘eruthros’-red, alluding to the showy red flowers of the Erythrina species. It flowers during winter and spring, after shedding most of its leaves. Pods open during spring. The generic name means red-colored, in reference to the flowers. The species name honors the Italian naturalist Carlo Giuseppe Bertero (1789-1831). Machete, a common name, is suggested by the flowers with standard petal shaped like a machete blade and the calyx forming the handle. 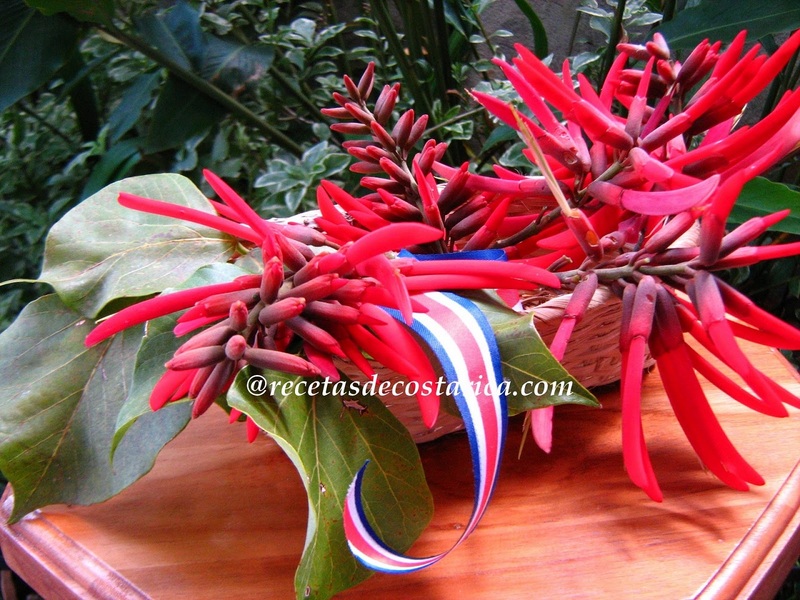 The common name piñón de pito in Cuba refers to the use of the flowers by small boys in making whistles or flutes. The corolla placed in a hollow petiole serves as a reed. In a soup kettle, bring beans to a boil in water, add bay leafs, salt and simmer, covered about ½ hour. In a large saucepan, combine cubed pork meat or pork ham (remember the meat is optional), and frying it until it renders fat, when meat is browned add the pork into the boiling beans, then reduce to a bare simmer and cook for 1 hour. In remaining lard sauté the onions, garlic, celery, carrots, Pitos, potatoes, cumin and oregano stir until fragrant about 10 minutes, then add tomato sauce, reduce heat until sauce barely simmers. Then add the mixture to the boiling beans and the three Ajíes verdes, let it simmer uncovered on medium heat until thickened stirring occasionally until beans are tender. Even if the red beans are being served as a side or soup to accompany other stuff, I still like adding a little bit of chopped up pork meat because it lends good flavor. You can leave out the meat completely if you wish and just make a bacon “sofrito” too. Red beans depend heavily on pork; they are usually always cooked with pork products. But if you are a vegan person, then you can substitute for a good quality olive oil, but it won’t be the same! Yucca Guatemalensis (more widely known by the incorrect name Y. elephantipes) is the tallest of the Yucca species. People call them yuccas, but in their native areas of Central America and Mexico, they are rather known under the names of Itabo, Izote or Daguillo. Their closest relative is the famous Agave from which tequila is made. There are about 40 species of yucca (in the genus Yucca), from southwestern US and Mexico to South America and the Caribbean. Since ancient times, many centuries before the Europeans discovered the Americas, the flowers of Flor de Izote were used in cooking and preparing beverages by the Native Americans such as Mayas, Aztecs and Incas. Flor de Izote is a genus of perennial shrubs and trees in the agave family, Agavaceae. Its leaves are pliable and lack the sharp spines on the tips that are so characteristic of most yuccas, getting up to 30 ft tall. With age the trunk becomes rough and thick, and when mature it develops a swollen base and often branches a few feet off the ground. The leaves, which grow in a spiral rosette are shiny green, to 4 ft long and about 3 in wide with serrated margins. Blooms are edible and high in calcium and potassium and can be use in salads, cooked dishes, and in making refreshing beverages. Yucca Elephantipes is distributed across southwest of the Northern hemisphere, and widely grown as a drought-tolerant ornamental in the South-Western USA. 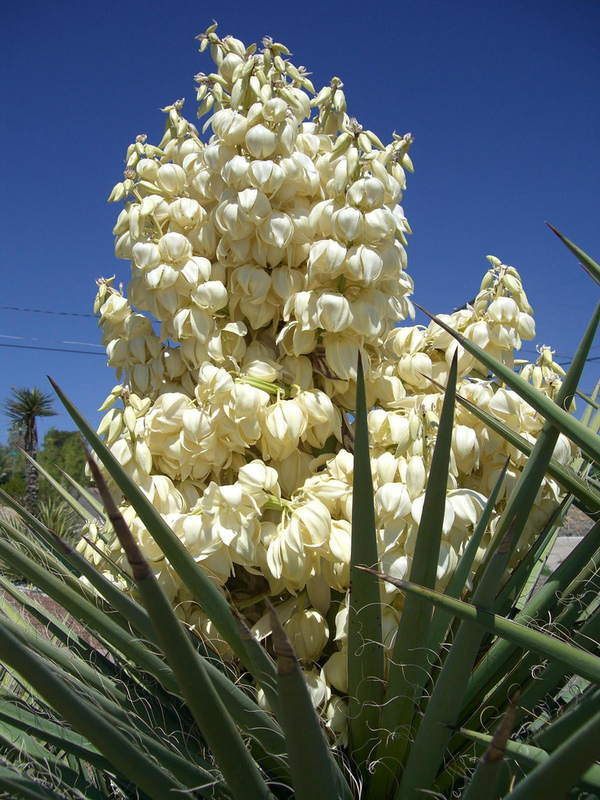 These are the “flor de izote”, or yucca flowers that are considered a delicacy in Mexico and in some Central American countries. The long, sharp leaves of yucca plants have earned them names such as Spanish bayonet, Spanish dagger, and Adam’s needle. Perhaps the best known of the some 40 species of yucca is the Joshua tree. While many yuccas are small and stem less, the Joshua tree has a trunk that can grow to more than 33 feet (10 meters) high. Yuccas belong to the lily family, which scientists call Agavaceae. The flowering season of the Itabo is between March and April and coincides with the Holy Week religious celebration. Usually the people eat the flowers of the Itabo cooked with eggs. Spineless yucca is often used as a framing specimen at the side of a building or along a walkway. It makes a striking presence in large landscapes, but may be too much for a small yard. Since they lack the sharp spines of other yuccas, spineless yuccas are harmless and can be used where most others cannot. They are grown in containers and sometimes seen in indoor malls. That usually involved digging a hole, lining the hole with rocks, building a huge fire in the pit, and when reduced to ashes, putting the plant in and covering it to hold in the heat then coming back the next day to dinner. That ended up with some partially cooked agave and there is evidence some of them were also eaten raw. In the Tehuacan area of Mexico a traditional way to have agave flowers is boiled and then mix with scrambled eggs. The Indians of Oaxaca also use the outermost leaf layer to make a covering to preserve and protect food. Clean the Izote’s blossoms, removing the stems, if desired, and the small green pistils (unopened flowers) at the base of the stem. Gently wash the flowers in cold water to clean. Carefully twirl to remove most of the water, and then drain thoroughly on paper towels. Set aside. Heat oil in a heavy skillet over medium heat. Cook onions, thyme and the Izote flowers until tender. Then add the potatoes, the eggs (already beaten) cumin, salt and white pepper. Stir until well blended. Remove from heat, sprinkle in fresh cilantro. Serve with wild rice and your choice of meat, if desired. You can eat the flower and the pistils, but separately (unless you had previously known the taste) because they are bitter. You can cook them in water for about 15 minutes, put them in a jar with diced onions, diced carrots, jalapeno, vinegar, olive oil, salt and pepper and leave in the refrigerator to pickle. Remove the pistils, wash the flowers, and cook them in water for about 4 minutes. Then pat them gently dry and set apart. Sift together all dry ingredients. Whisk the milk, egg, and anise seed until frothy. Combine flour and milk mixtures to make dough. Add Izote flowers and stir well enough to distribute ingredients evenly. Heat oil in a deep frying pan on medium heat. Using a small ladle, scoop some mixture and slowly drop it into the hot oil. Fry circles until golden brown, turning once. Depending on the size of your frying pan, place only about 4 patties into the pan at a time; that way you will create a lovely crisp crust around them. Drain on paper towels. Sprinkle with sugar/cinnamon mixture. My Grandma used to make these patties for our family on Semana Santa (Easter) for Sunday lunch. Easy and delicious. 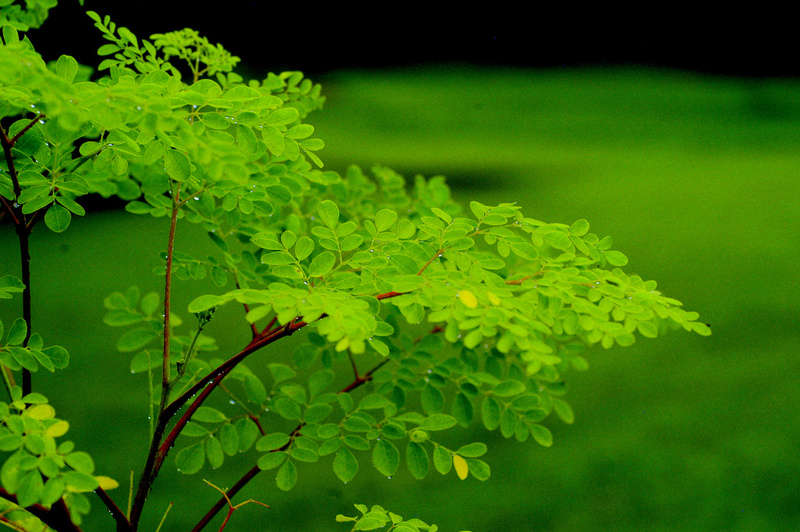 Moringa: The naturalized tree in Central America. For centuries indigenous people in northern India and many parts of Africa have known the many benefits of Moringa oleifera. Its uses are as unique as the many names it is known by, such as Clarifier tree, Horseradish tree, Drumstick tree and in East Africa it has the alias “Mother’s best friend”. Moringa is the most widely cultivated species of the genus family Moringaceae. It is a multi-purpose tree cultivated throughout the tropics. 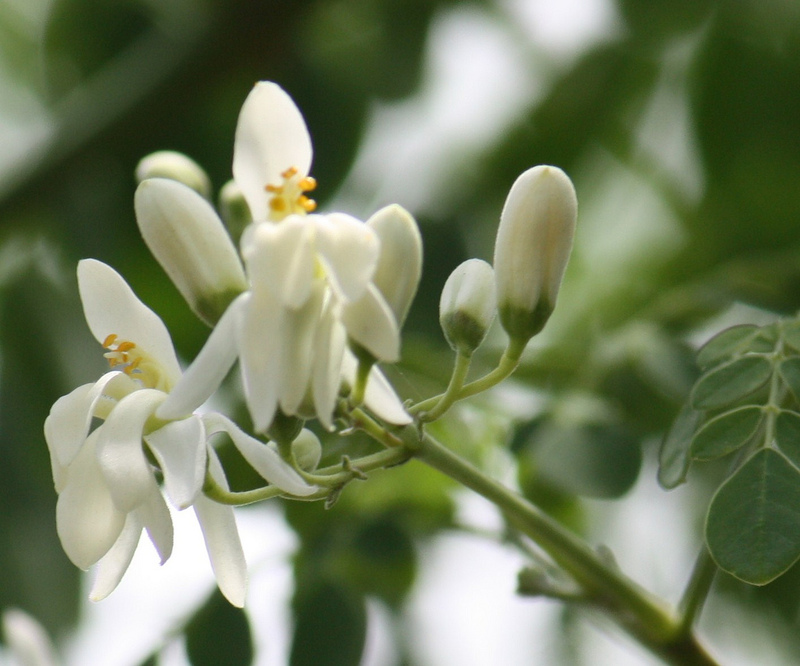 The Moringa tree is believed to have been introduced into Guatemala in the eighteenth century. However, it has been naturalized in at least 70 countries across the tropical and subtropical regions of the world. 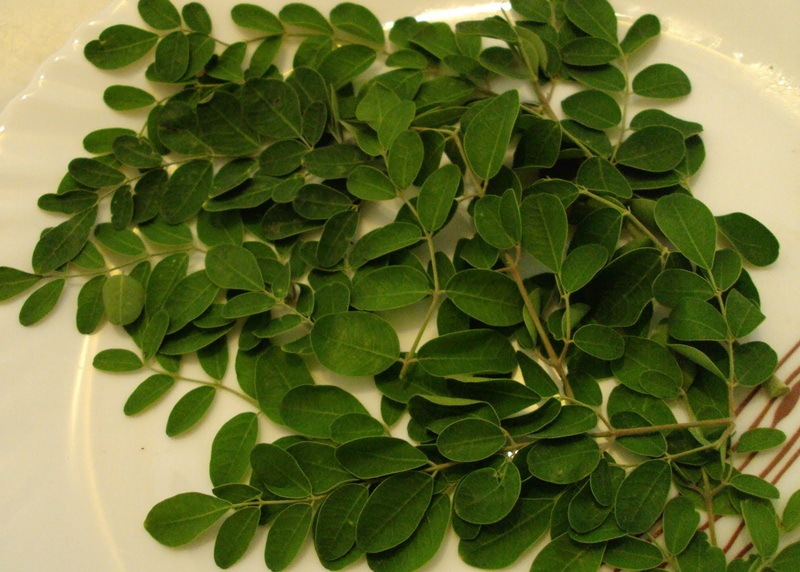 Moringa has over 150 names around the world so keep this fact in mind when looking for the fresh leaves. Moringa oleifera is a deciduous tree occasionally growing up to 15 m in height, but is usually less than 10 m tall. It has a large underground rootstock and normally a single main trunk with a wide, open and typically umbrella-shaped crown. The trunk is generally 10-45 cm wide and covered in a pale-grey bark, but may occasionally reach up to 60 cm in diameter. The large alternately arranged leaves are borne on petioles 4-15 cm long. These leaves are tri-pinnate and usually 25-60 cm long, but they may occasionally be as small as 6.5 cm long and as large as 90 cm long. The leaves have 5-11 main branches that are pulvinate. Each of these branches is borne on a stalk 1-3 cm long and has 5-11 smaller branches. Flowers are white to cream, fragrant and about 2.5 cm across. They are borne on pedicels 12-21 mm long and the flower buds are ovoid in shape. Each flower has 5 petal-like sepals and 5 petals. They are white or cream, sometimes with yellow streaks in the centre, and are usually puberulent. The white or cream petals are slightly spoon-shaped, 1-2 cm long by 5-6 mm wide, with prominent veins. They have acute apices and are glabrous or puberulent at the base. The large elongated capsules (usually 18-50 cm long and 1-3 cm wide, or occasionally 10-90 cm long) have 9 indistinct lengthwise ribs. These fruit are green and somewhat tomentose when young, but turn pale brown as they mature. They are dehiscent and split open via three valves when fully mature. The numerous seeds, about 20 in each fruit, are sub-globose or slightly three-angled (7-15 mm across) with three papery wings (5-25 mm long and 4-7 wide). They are dark brown or blackish in color and embedded in the pits of the valves of the fruit. Other than that, it is an exceptionally nutritious vegetable tree with a variety of potential uses. The leaves contain all essential amino acids and are rich in protein, Vitamin A, Vitamin B, Vitamin C, and minerals and are used in many Spanish recipes. The dried leaves as flour are used as nutritional supplements for mothers at risk of malnutrition and malnourished children. 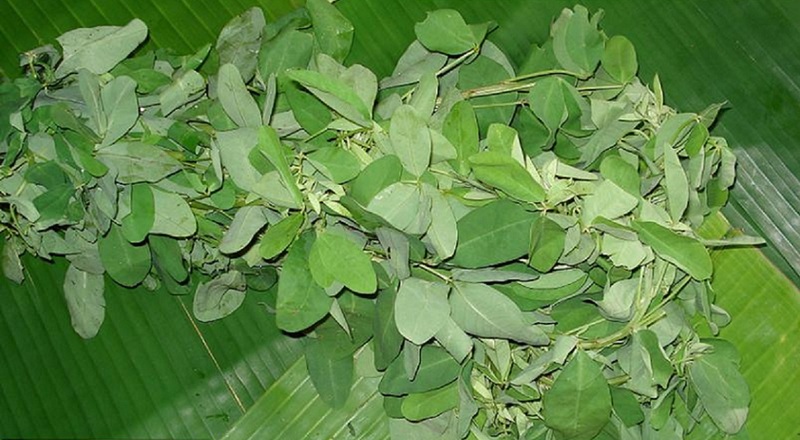 The powder obtained from the leaves has also been administered to pregnant women as a supplement. Extracts from the leaves are also used as a growth hormone and as livestock feed. The Moringa tree also yields beautiful flowers all year round. These edible flowers are a great source of calcium and potassium and are frequently used to make tea. Sadly to say, for people that live (like me) in the western states, we can grow Moringa in the backyard. But Moringa doesn’t like the cold and loses it leaves in the winter. For those of you that have a true winter, where it freezes and snows, I recommend that you plant Moringa in pots, keeping them outside in the spring and summer and bring them inside when it gets cold. If you love salad greens, spinach, collards, and other greens, you will love Moringa. Right off the tree, it almost has a spinach-watercress taste. Wash and pressure cook the toor dal along with asafetida, turmeric pwd. Heat oil in a pan, season with methi seeds, mustard, cumin, red chilly and curry leaves. Wait to crackle. Add chopped onion and sauté till it turns light pink. 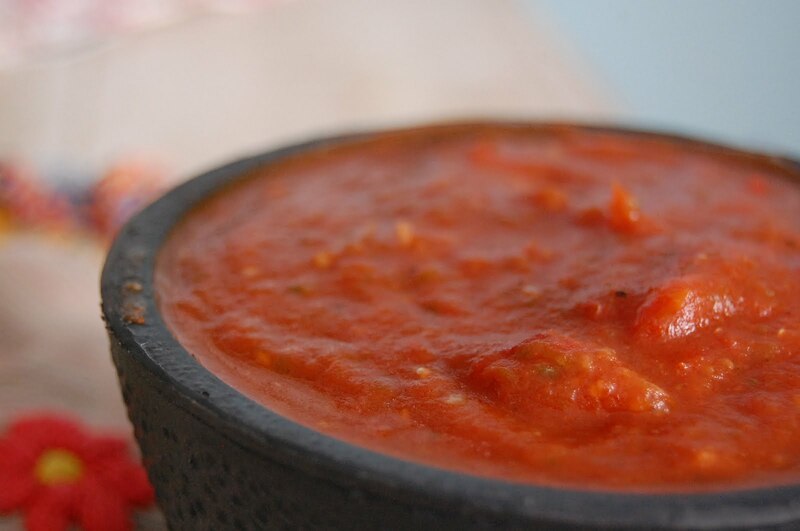 Add chopped tomatoes, stir until it is cooked. Now add turmeric pwd, red chilly pwd, coriander pwd and salt. Stir well add Murungai (drumstick leaves). Sauté in low flame. 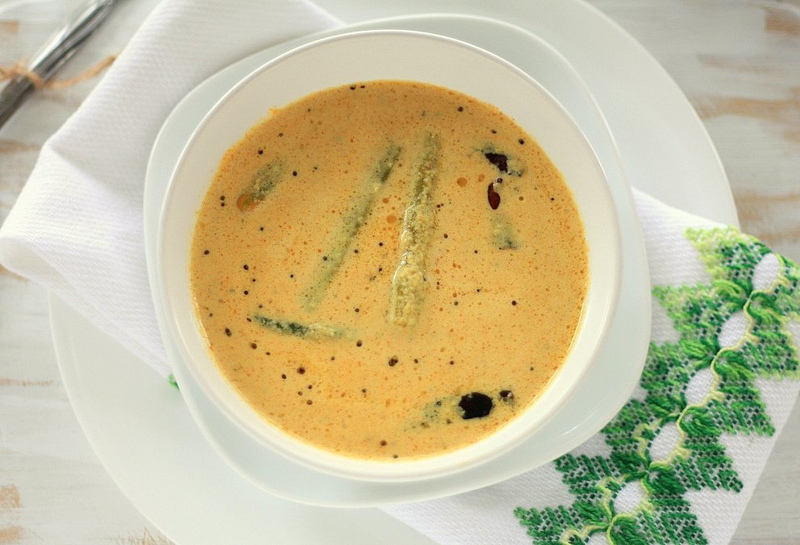 Add sambar pwd , salt , water and allow to cook covered for 5 mins. Now add the mashed dal, tamarind juice. Stir well and allow to boil for 2 to 3 mins. Serve hot with white steamed rice. 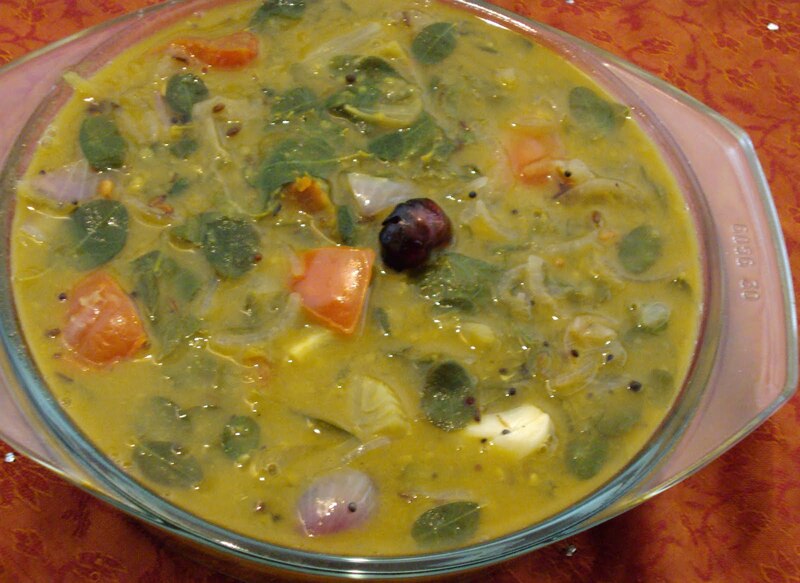 Cook Moringa in 1 cup or enough water to immerse them together with turmeric, ¼ tspn salt and green chilies. Cooked to done but not falling apart. That will be about 10 minutes. Note that I have used frozen drumsticks. Grind coconut, jeera and garlic cloves to a fine paste, and add to the cooked drumsticks. Use water to make a thin or thick gravy to your preference. Take the pan off the heat as soon as the curry heats through. Check for salt and add to taste. Heat coconut oil in a small pan splutter the mustard. Follow it with shallots, red chilies, and curry leaves, and pour over the curry. Serve with rice. 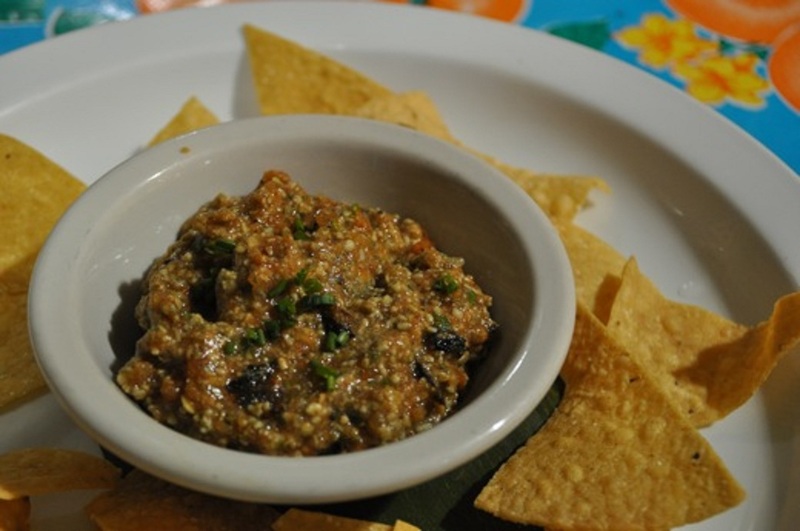 Chipilín is native to El Salvador and is a staple in the Salvadoran diet and popular among Guatemalans and people from southern Mexico. This green leafy vegetable is not cultivated on an agricultural scale; it’s something you might find at farmers’ markets. Chemical analyses show that the foliage is rich in calcium and iron. We must be careful of the seeds and roots since they are undeniably toxic. 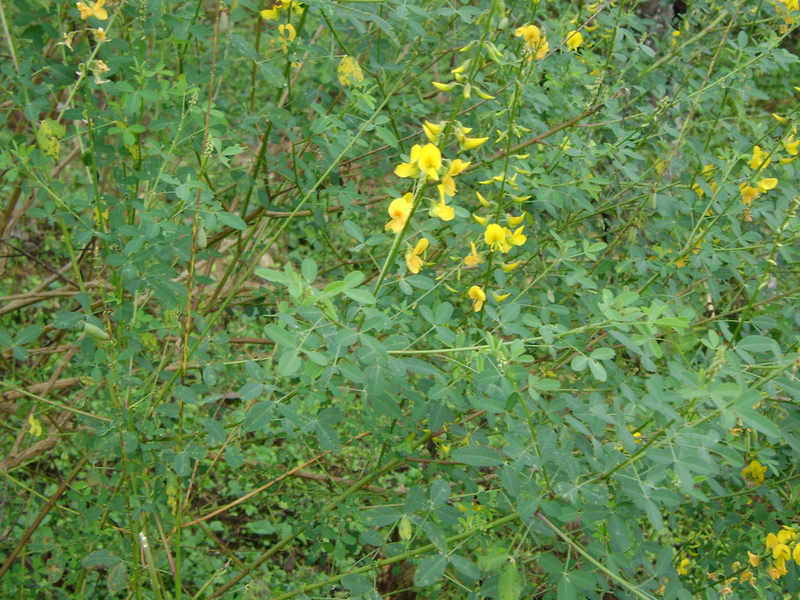 Introduced populations of this perennial legume exist on the island of Maui in Hawaii. In Australia importation has been banned because it is an invasive plant that disrupt and take over natural habitats. Other common names of plants that fall under this genus are longbeak rattlebox and chipilin. The name rattlebox comes from the fact that as the heart-shaped seeds mature, these seeds detach, become loose in the pod, and produce a rattling sound when shaken. Derived from the Greek word crotalus, the name of the genus also means castanet. 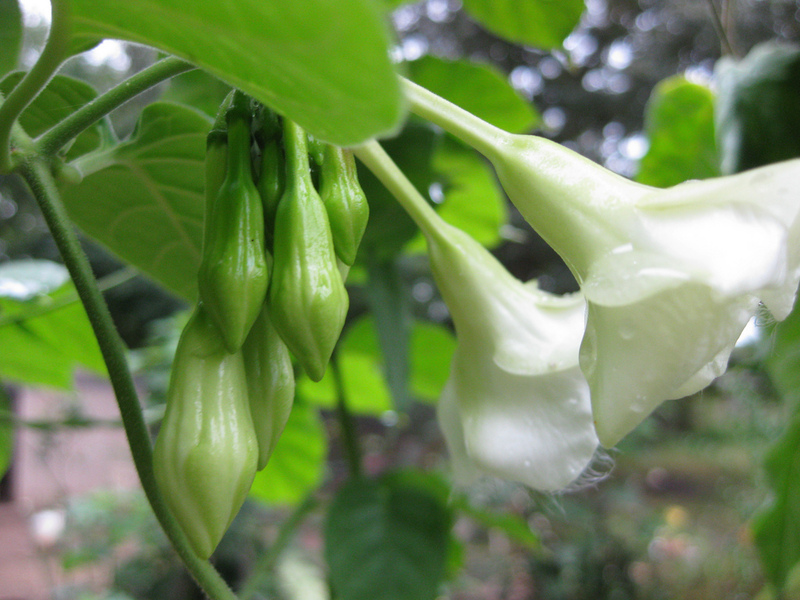 The chipilín (Crotalaria longirostrata) is a tropical legume domesticated since pre-Hispanic times maintaining the anthropocentric characteristics reported for other plants of the country. It covers a wide range of uses such as: food and refreshing drink for humans, cover crop or green manure (by fixing atmospheric nitrogen), improvement of fallows, paper elaboration, medicinal plant and melliferous species. An alternate possibility for its use would be as forage for animal feeding, as has been reported in Mexico and other countries. Notwithstanding that Crotalaria longirostrata is considered at world level as one of the 16 most important species of edible leaf, literature reports on it’s chemical composition and/or its nutritional value in Mexico are scarce. The present study describes the nutritional value of the plant evaluated by means of its chemical composition and in vitro digestibility. Anyhow, Chipilin leaves can be boiled much like Pak Choy or Spinach. But much more common is the incorporation of finely chopped leaves into tamales, pupusas, soups, or sauces. You can used it in sautéed, or dried for seasoning. My Grandma would only use it for chipilin rice soup twice a week, (a good source of iron and calcium for her grandchildren) this soup is traditionally made with chicken or pork with rice, carrots, chayote, potatoes , green beans and aromatic spices that required a long, gentle simmering. As for me, my favorite was cream of corn with these edible flowers. This vegetable is hard to find here in the USA. Though, frozen products are an alternative for creating Central American dishes. Start by creating your soup base – boil your clean vegetables in water until they are tender. The chipilin is very flavorful, so I recommend not using something too strong that will compete with the flavor of the chipilin. Here I’m just using carrots, onion, garic, celery and chayote. I didn’t even bother to chop the vegetables; I just boiled them for about ten minutes until they were tender. Remove the vegetables and save them for later. Soak half a bag of the frozen chipilin it in a large bowl of water. The chipilin is very strong so you don’t need a lot. After a few minutes start separating the thawed leaves and move to a different container, leaving grit, dirt and the tough dry grass-like stems behind. You should end up with just the clean tender green leaves, discard everything else. Create the dumplings by combining half a cup of the warm broth and one cup of masa harina. Mix until the flour becomes crumbly, add a little bit of olive oil and start kneading by hand. 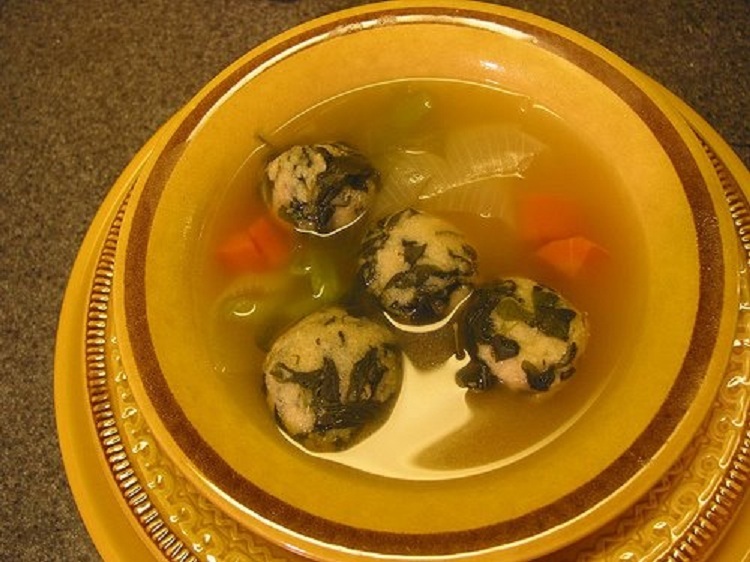 Incorporate the thawed chipilin leaves, adding more liquid as necessary.With wet hands form several bite size balls (about the size of a ping-pong ball) and set aside. Bring your broth to a soft rolling boil. Add your “bolitas” one by one, until all of them are completely covered in broth. Cook them gently until they start floating (about 8 to 10 minutes). Chop the cooked vegetables and add them back to the soup. Season with salt and pepper and serve hot. In a blender, mix the corn dough with the water and strain to remove lumps. In a frying pan, sauté the onion, the bell pepper and the chicken, add the dough and the chipilin leaves, season and let cook for 25min at low heat. 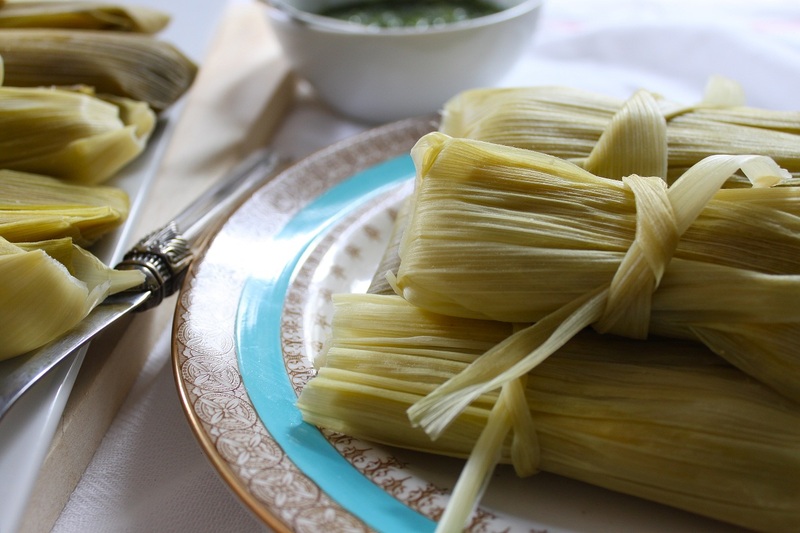 Cut the banana leaves in 25cm squares to make the tamales, stuffing each square with approximately 150 gr. of dough. Once all the tamales are made, put them in a steamer for 1hr and 30 min.The tamales can be served with hot tomato sauce. Loroco is a popular edible flower of Central America and southern Mexico, and was called Quilite, which in the indigenous language means “Edible herb”. The name “loroco” is used throughout Mesoamerica to identify her original name. 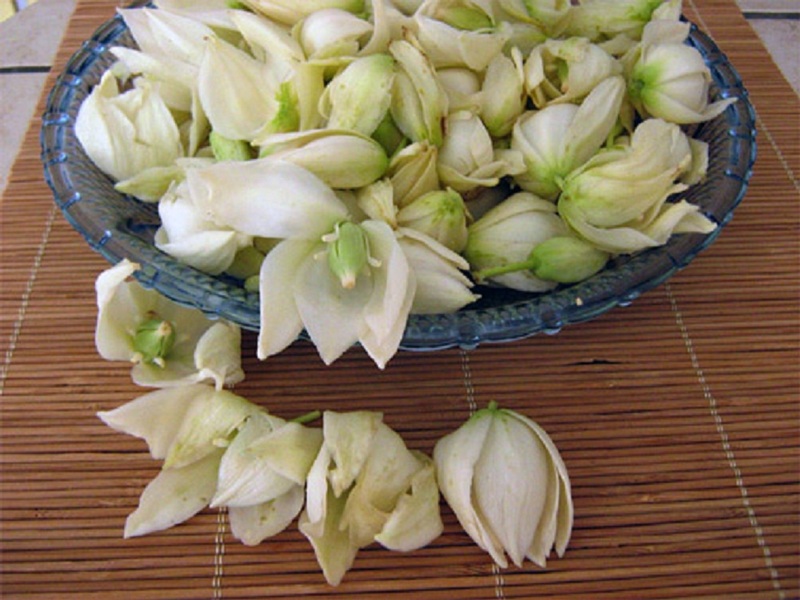 The flowers are harvested and used in almost every Guatemala and El Salvador’s kitchen cuisine, because it is an important and popular source of food. The plant’s buds and flowers are used for cooking in a variety of ways, including in Pupusas, El Salvador’s most well-known dish. (A thick corn tortilla stuffed with anything from cheese to pork, seafood or veggies). In Central America, flowers are produced all-year-round but in S. Florida it produces few flowers in winter. Clusters of unopened buds and partially- and fully-opened flowers are clipped from the vine and stored in well-ventilated baskets (not in plastic bags). If required for export, they are quick-frozen or canned. Fernaldia pandurata is a herbaceous vine with oblong-elliptical to broadly ovate leaves 4-13 cm. long, 1.5-8 cm broad, inflorescences are generally somewhat shorter than the leaves, with 8-18 flowers, the pedicels 4-6 mm. long; bracts ovate, 1-2 mm long; calix lobes ovate, acute or obtuse, 2-3 mm. long; corolla white within, greenish outside. This natural aphrodisiac product contains vitamins A, B and C, besides calcium and iron. It is rich in fiber, all of this nutritional information is backed by two analytical reports prepared by “Instituto de Nutricion de Centro America y Panama” I.N.C.A.P. (Nutritional Institute of Central America and Panama). This product consists of the flower of the Loroco, which are very aromatic and pulpous besides, it is low in calories (only have 32 in 100gr). Loroco has more nourishing properties in the nourishing composition table which shows that 100gr of Loroco flowers have 89.3 gr of water. Thanks to the fiber, it also has spasmodic properties, which act like a relaxing component. 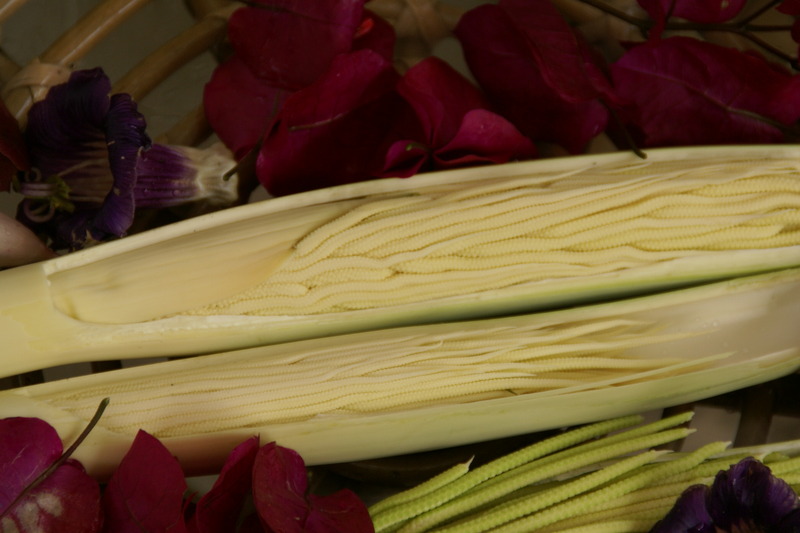 The Loroco flower definitely has a distinctive taste, a highly aromatic earthy- artichoke, flavor with overtones of nuts. 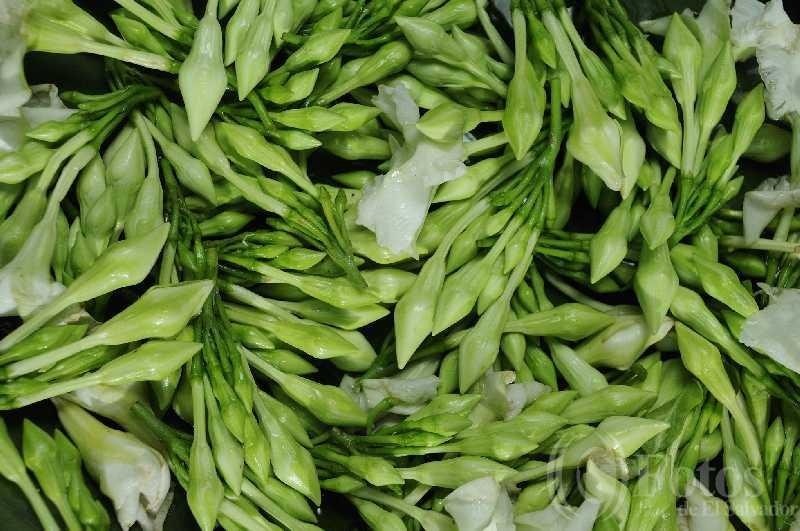 It is used in salads, rice dishes, stews and sauces. Unfortunately, only if you get it fresh you will experience the flavor when it is cut and used in recipes. Frozen, it loses its flavor. Anyhow, it comes in jars (brined or pickled in vinegar), or frozen. Cut spaghetti squash in half length-wise. 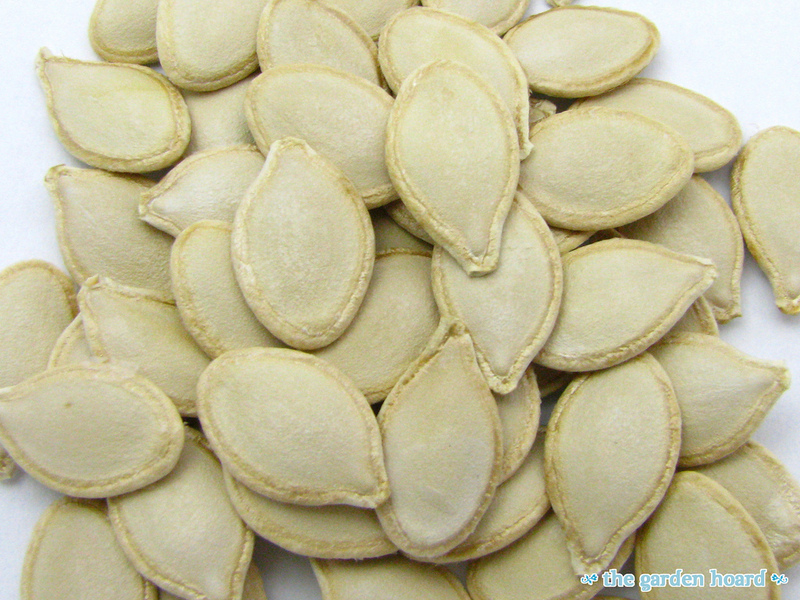 Carefully scrape out seeds, but do not cut into the body of the squash to leave half inch rim. Chop the scraped pulp into bits and cook in butter with onions and garlic until onions are soft. Combine; sautéed ingredients with breadcrumb, cheeses, tomatoes, herbs and eggs. Salt and pepper al gusto. 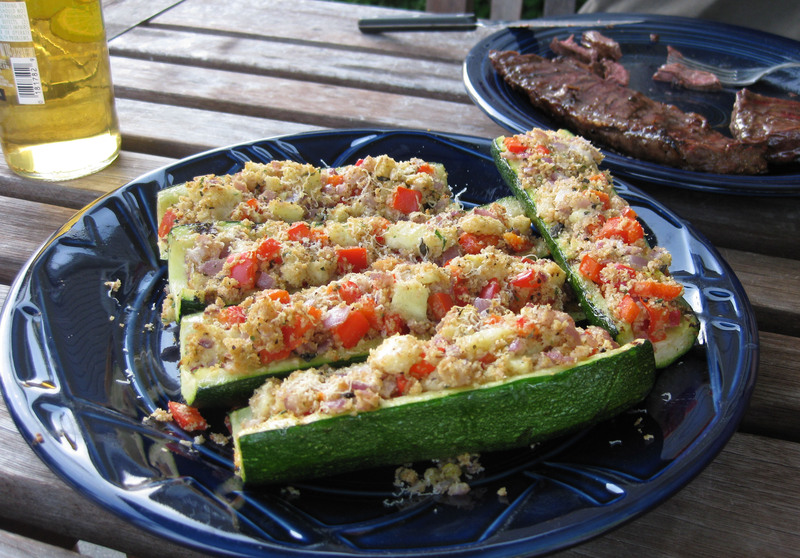 Fill each zucchini with mixture and sprinkle with paprika. Bake at 375° for 30 minutes until solidified. Put on the blender the Loroco, chicken broth, jalapeno, garlic and cashews and process until completely smooth. In a large skillet sauté the five ingredients in butter and oil over medium heat stirring occasionally until sauce are bubbling. Add heavy cream and lemon juice: simmer until sauce thickens and coat the back of the spoon. Serve hot over the squash. Delish! How do we know what and how ancient people ate? 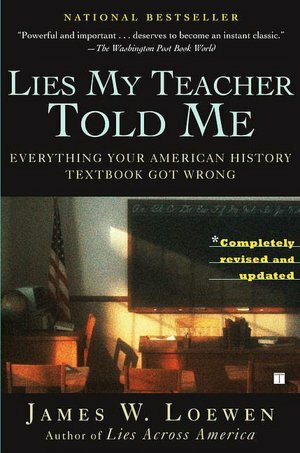 Fortunately Mesoamerica provides several lines of evidence. The documents written by the early Spanish conquistadors offer invaluable insight into the customs of early Mesoamerican civilizations. All cultures utilize a staple food around which the rest of their cuisine is based; in Europe and the Middle East it is wheat, and in the Far East, rice. In Mesoamerica, the staple undoubtedly was corn, or maize. The original, traditional food of the three high cultures of native America – the Maya, Aztecs and Incas – are quite different from what we know as ‘Mexican food’ or ‘Peruvian cuisine’ today. Food of the Mayas, Aztecs and Incas were heavily influenced by the surrounding environment where they were located; various climates and soils have conditioned how people cultivated and ate. They mainly included a variety of grains and meat that were originated in the areas people lived in, having maize (corn) as their most important staple food and using it for various purposes other than just for food. 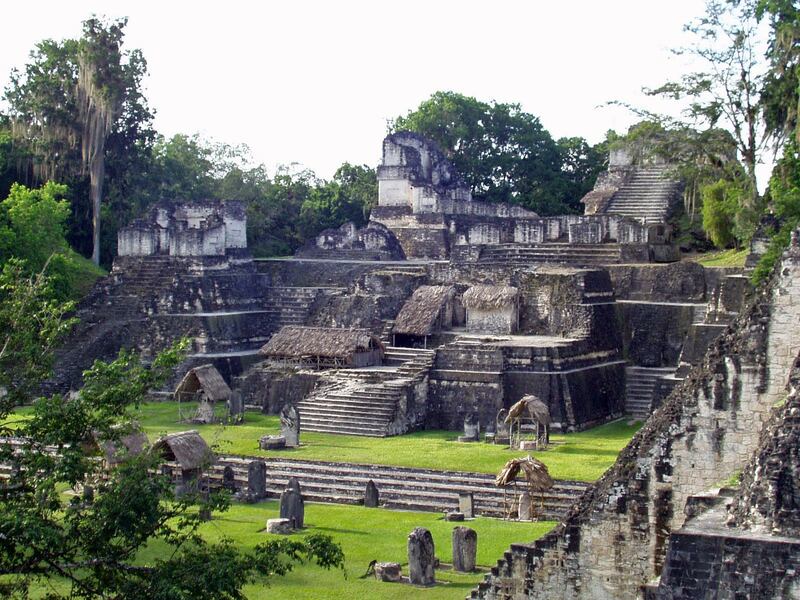 It has been said that Maya agriculture was the foundation of civilization. Despite living on the lands which agriculture did not actually fit well, with numerous skills and techniques, Mayans cultivated various staple plants and focused their diet on four primary crops: Maize, squash, common beans, and chili pepper. Beans were also considered as important; several kinds of beans were grown and used in various kinds of food of Maya. Other than important plants, various kinds of fruits and vegetables were cultivated, including tomato, avocado, guava, papaya, pumpkin, pineapple, and sweet potato. Various herbs were also grown, including vanilla, oregano, allspice, hoja santa, and garlic vine. People of Aztecs ate two, or sometimes three, meals per day, though it is sometimes controversial whether they counted drinking atolli as one meal, since drinking thick atolli could intake much calories that could be earned by eating regular meals. In addition to staple vegetables, numerous kinds of spices and herbs were used in their meals. Among many kinds of spices, chili peppers were the most important ones, coming in a wide variety of species, both domesticated and wild. The diet of Aztecs was mostly vegetarian. 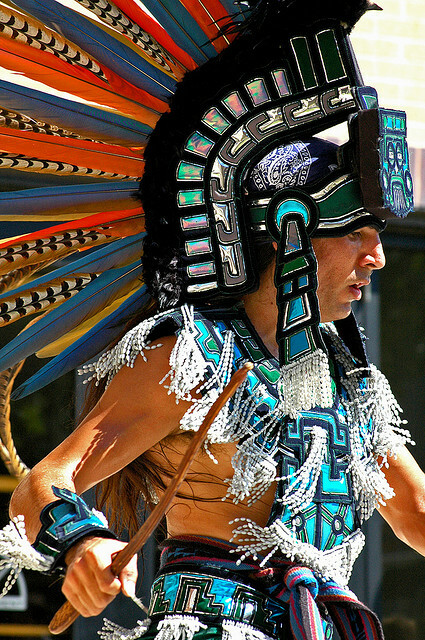 Although it has been known that Aztecs consumed a considerable amount of acocils, a kind of small shrimp, other animals they consumed, including various kinds of fowls, gophers, and green iguanas, were only a minor contribution to their diet. 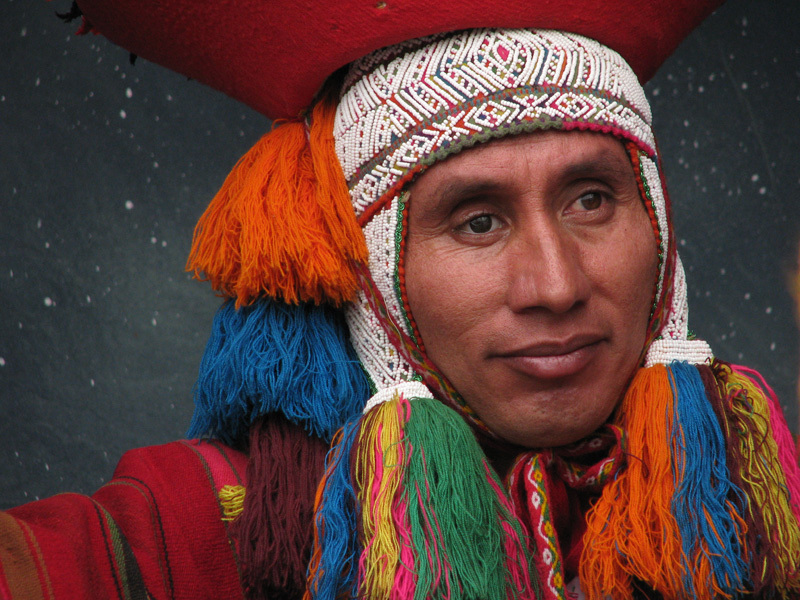 It has been said that the food of the Incas, or Andean cuisine in other words, has originated in pre-Columbian times, around 10,000 BC, by the first horticulturists; they mainly included plants like potato and yucca, and they used tubers to grow these plants. 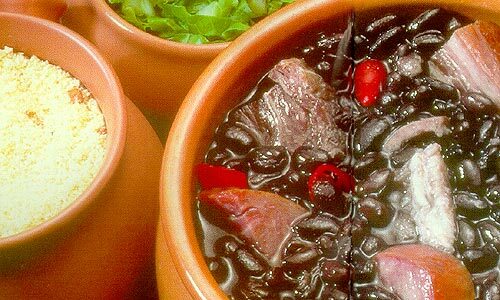 Along with various kinds of plants, Incas consumed various sources of meat. Mainly, Incan people usually domesticated llamas, alpacas, and vicunas, all of them being large-four legged animals that resemble camels. 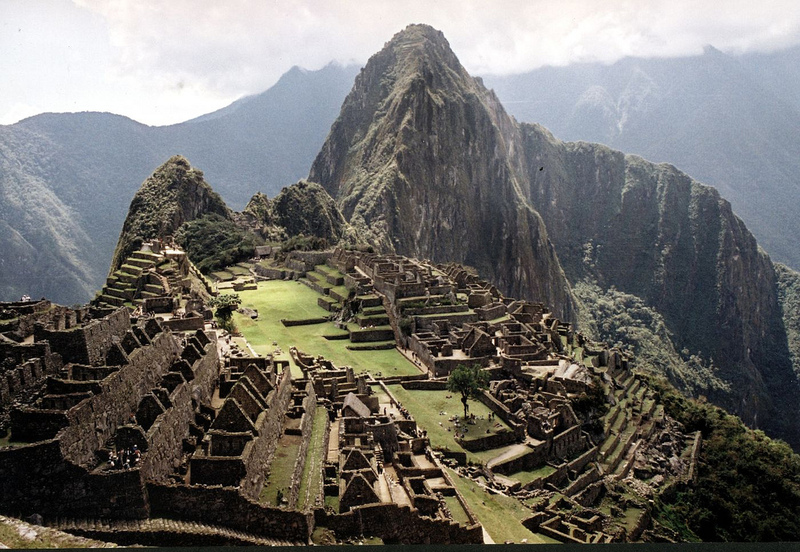 One interesting thing about the Incas is that they used edible clay as food. Inca had several types of edible clay like chako and pasa, which were used as a sauce for vegetable dishes and religious uses. Edible clays, in fact, were quite important to Incan food life, since they were part of the essential ingredients of Inca cuisine.